Lenovo Yoga 2 Tablet Specifications:-Lenovo is well known for its laptops and PCs but know it it alsoÂ targeting smartphone and tablet market as well.Â Lenovo yoga Tablet which was launched last year is one of the good looking Tablet in market.Lenovo has launched its successor Yoga 2 which almost identical to its predecessor.It retained tubed edge of its predecessor which doubles up as a grip for carrying around,cracking dual stereo speakers and an adjustable kickstand which is its biggest advantage which suits different needs such as web browsing,reading, watching videos etc.Lenovo Yoga 2 Tablet SpecificationsÂ are quite promising like its design.Yoga 2Â Â is part aluminium and part plastic.Its kickstand and the sides are made of shiny aluminium alloy and its back cover is made of plastic with a chrome finish.Lets have a look at detailed Â Lenovo Yoga 2 Tablet Specifications and reviews. Yoga 2 tablet operates on android 4.4 kitkat operates system.It features a 10 inch IPS LCD screen withÂ 1920×1200 pixel resolution.Yoga 2 is powered byÂ Intel Atom Z3745 which clock speed of 1.33 GHz and 2 GB RAM .It features 64 GB Â internal storage Â which can be expended up to another 64 GB with microSD card.It includes a 8 megapixel rear camera and a 1.6 megapixel front camera.It is powered withÂ 9600 mAh battery.For connectivity there is wifiÂ 802.11 a/ b/ g/ n,bluetoothÂ v 4.00,Micro-USB. Lenovo yoga 2 look like a premium device with its aluminium and plastic body.Its kickstand and the sides are made of shiny aluminium alloy and its back cover is made of plastic with a chrome finish.It is little heavy due to its kickstand whichÂ makes it difficult to hold for long duration.The kickstand also has a hole in the middle of it, so Â you can hang the tablet on a nail or hook against a wall when you are working hands-free, at face height. Yoga 2 tablet comes up with a giant Â 10 inch IPS Â LCD display withÂ 1920×1200 pixel resolution so you can reed book,watch videos,play games on such large screen.It also features better colors and saturation.Screen doesn’t play well in in direct sunlight which is its main disadvantage. Under the bonnet there is a 1.33 GHzÂ Intel Atom Z3745 for smooth processing with 2 GB RAM to provide fast processing.Device features Â 64 GB internal storage which can be extended upto another 64 GB with microSD card . It operates on Android 4.4 kitkat rather then latest android version 5.0 lollipop.Lenovo yoga 2 has its own launcher installed which mimic iOS to a great extent. It features 8 megapixel rear camera which offers average picture quality and no flash which is its biggest demerit.It includes a 1.6 megapixel front camera which is only good for video calling. Yoga 2 is powered byÂ Â 9600 mAh battery.with light usage it last long for almost three days.Its battery life is its main advantage.For connectivity it hasÂ wifiÂ 802.11 a/ b/ g/ n,bluetoothÂ v 4.00,Micro-USB. 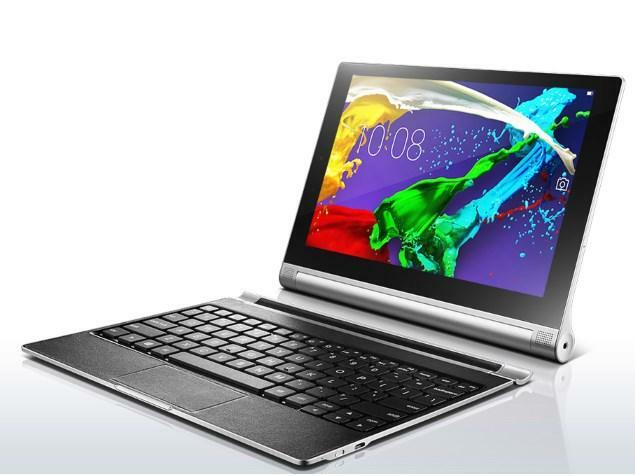 Yoga 2 is available at price tag of $469 in US. Yoga 2 is available at price tag ofÂ Rs. 28990 in India. Lenovo initialyÂ struggled to create a great tablet but Know its on right track.Yoga 2 is its latest attempt its looks great with its premium design.Its plastic and aluminium body with itsÂ tubed edge and kickstand makes it look stylish.It is packed with great hardware.Its main merit is its battery life which last long for almost three day Â on light usage.Its biggest drawback is its software.Lenovo needs to step up its software game.The hardware is filled with potential, but the software is continuing to hold it back otherwise Lenovo yoga 2 is a good tablet at affordable price.